Odor Elimination Technology! BIODEGRADEABLE: 1.Food Grade Citric Acid 2.Non-Corrosive 3.Non-Toxic IT'S SAFE: 1.No Residue Left Behind 2.No Hand to Chemical Contact 3.Preserve Fabrics and Surfaces AND EASY TO USE: 1. 3 Step Process 2.Just Add Water 3.No Electricity or Equipment Required !!! 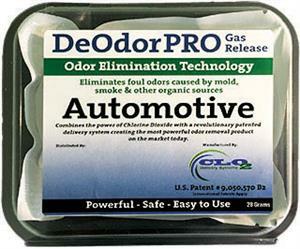 Gets Smoke & Tobacco Mold & Mildew Pet & Skunk Food, Vomit, Urine Plastics, VOC’s & Chemicals and more out of your car! NOW 25% MORE ACTIVE INGREDIENTS---SUPERIOR PERFORMANCE!! !